Officer Jacob Moore, who does not have firefighter training, said he went into the burning house simply because he thought the Atkinsons were inside and needed help. 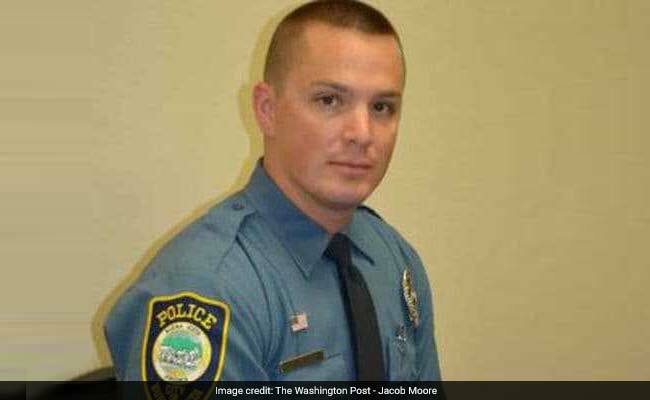 Officer Jacob Moore stepped into the Buena Vista, Virginia, police station one morning last week and heard an alert that a house was on fire. It was on the street where he lived. He got into his squad car and dashed over. Flames were leaping off the house of a retired couple he knew - which was four houses away from his own home. He went in the front door and saw one of the homeowners, Lovie Atkinson, standing in the kitchen as it quickly filled with smoke. "She didn't know what was truly going on," said Moore, 28, who has been a Buena Vista officer for two years. "She was standing there screaming for her dog. She didn't want to leave her dog. She was screaming, Zoey! Zoey! Zoey!" Atkinson was also worried for her husband, who she said was asleep downstairs. Moore got her outside and told her he'd go back in for her husband and dog. He then went down to the basement to get Thomas Atkinson out of the house. The rest was captured by his body camera: Atkinson ran back into the house and went upstairs, yelling for Zoey, who began to bark. "The smoke was so heavy you couldn't see," Moore said. "You had to get down real low." He found the small dog, tucked her under his arm and made his way outside, coughing from the thick smoke. In the video, Moore hands Zoey to a very grateful Lovie Atkinson as one side of her house is engulfed in flames in the background. "Her dog is pretty much her world," Moore said. "It's her pride and joy." Moments after everyone was safely out of the house, the firetrucks arrived. But they were short-staffed. In Buena Vista, a small city of about 6,500 people in the Blue Ridge Mountains, police officers and firefighters help each other out. One of the firefighters handed Moore a fire hose and told him where to point it, the police officer said. Shortly after, additional firefighters arrived, and the flames were extinguished. Moore, who does not have firefighter training, said he went into the burning house simply because he thought the Atkinsons were inside and needed help. "It's just me wanting to save anyone I could," said Moore, who grew up in southern Virginia near the North Carolina border. He said that Lovie Atkinson ran a day-care business in her home for decades and retired last year. A GoFundMe page has been set up for the couple. The page details some of the fire damage and notes that almost everything in their home was destroyed, as were their cars. "They are such good people. Everybody knows them," Moore said. "They pretty much raised everybody's kids here because of the day care." Moore said this is his second time on the job running into a burning house. In December, he responded to a call and saved another family when their home was in flames. But this one hit a little closer to home. "It felt great to be able to do my job to its fullest," he said. "Especially that close to home."